The RadEditor FileBrowser dialogs are mainly used to insert objects in the content area. These are the Image Manager, Flash Manager, Document Manager, Media Manager and Template Manager dialogs. The FileBrowser dialogs also provide the ability to upload and delete files and directories. You can find more information about the File Browser dialogs in the following article: File Browser Dialogs. These dialogs are enabled by default. 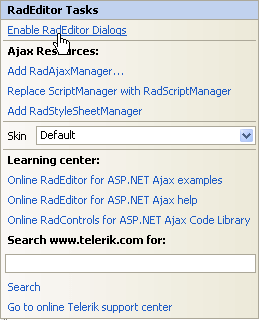 Dialog visibility can be toggled using the ToolsFile.xml or by populating the RadEditor Tools collection. RadEditor offers FileBrowser dialogs such as ImageManager, FlashManager and DocumentManager as well as others such as the HyperlinkManager, the About and Help dialogs. To enable dialogs, use the Smart Tag Enable RadEditor Dialogs option. You can find the full list of the required and optional web.config settings is available in the web.config Settings Overview article. As of Q2 2015, new phone-optimized UI is introduced in RadEditor—Phone Layout of RadEditor. You can find more details about the dialog-related optimizations in the Mobile Dialogs article.